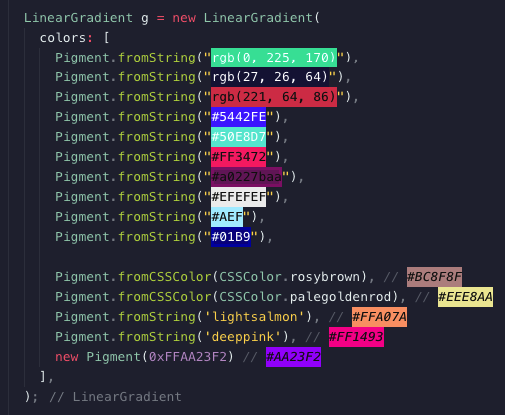 Pigment 1.0.1 can parse 'rgb()' (e.g. 'rgb(29, 123, 10)'). Added CSS colors with default name, you can access from this with CSSColor. * (e.g. Pigment.fromCSSColor(CSSColor.lightsalmon)) or directly with Pigment.fromString('lightsalmon'). First, add pigment as a dependency in your pubspec.yaml file. It's very simple, pigment add a new useful method to Color class, this method is Pigment.fromString(). Also like Color, you can use new Pigment().